Bespoke is categorically the highest level in the art of tailoring. This is the culmination of sixty to eighty hours of work, with involvement from over half a dozen people who specialise in a particular area of tailoring. As the process will vary at different tailoring houses, I will be specific to our process, which begins with your choice of cloth, selected from the finest cloth houses in the world. After deciding on the style details, a set of eighteen measurements are taken, and your configuration is noted. This is integral in the cutting of a pattern, as measures alone do not give answers as to where weight is distributed, nor as to whether one shoulder is high, or one shoulder is low for example. Your pattern is cut, using a technical system that has been passed down from Master to Apprentice since the late 1800s. We start from a blank piece of heavy duty paper, and use chalk and pencil to construct the lines. The wooden set squares, yard sticks and large shears are the tools of our trade, (as cliché as they may appear, they are not there so that tailors can look the part). Cloth is then cut, and prepared for the first fitting. 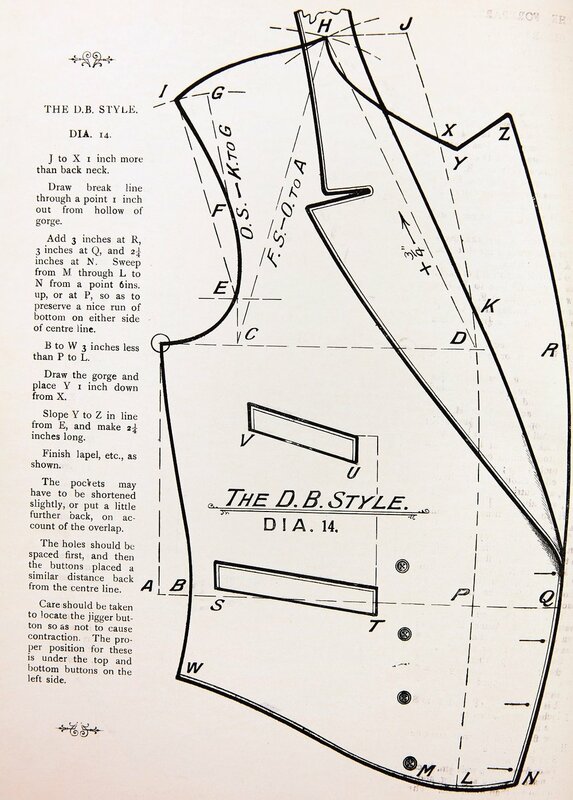 For a coat, the first fitting is entirely handstitched into what is known as a baste fitting. A skirt or trouser is part machined, part handstitched ready for the first fitting. The time in between the consultation and the first fitting, and also consecutive fittings are usually two to three weeks. The next stage is to re-mark the cloth, and to cut the necessary trimmings (structural materials such as canvas, felt, and pocketing etc.). The job is rolled up with the order details written out, and is now ready for a tailor to make up to the advanced stage which is two thirds made. 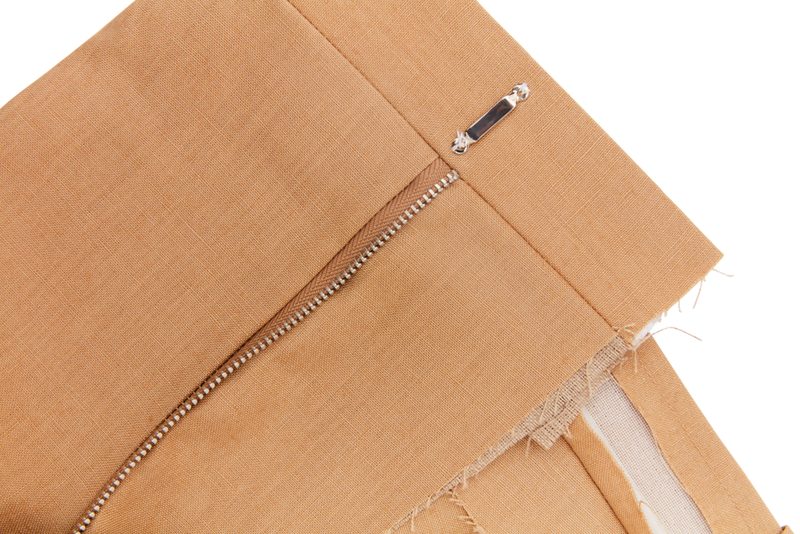 The majority of the work in a coat is handstitched, the only machining is the straight seams and the pockets. The trousers or skirt meanwhile are completed to a finish stage, with handstitched finishing. Your next fitting is the advanced stage, which is also known as a forward fitting. At this stage, the top collar is not on yet, and you will be able to see some of the intricate padding stitches that are used inside the garment. Your cutter will chalk and pin the necessary alterations on your clothing, talking you through what changes will be made. Although we will advise you on trouser length, and sleeve length, it is important that your personal preference is achieved, as there are no definitive rules. This is a fully personalised service. After this fitting, your coat will be given back to the coat maker to finish along with the alterations noted. This process takes a day or two to achieve depending on the complexity of the job, and then the buttonholes are marked before being given to a finisher who meticulously hand stitches the buttonholes, linings, and the finishing stitches. The presser will then carefully hand press the coat, and then the buttons are put on. It is now that your coat is ready for the final fitting, although contrarily you will most probably require one more fitting for minor alterations before you can take your garments home. It is an honour to continue this tradition of tailoring in its purest form. Whilst the traditions are an important part of what we do, there is room for progress in tailoring. It is of great importance to always use the best quality of materials, right through from the canvas inside the skeleton of a coat, to the silk threads used in finishing the garments. In a world that seems to be always looking to save time and money by compromising on quality and or service, there is a glimmer of hope in seeing businesses that value the slow more tortoise-esque way of working. From food, to fashion, the slow movement is gaining momentum. Thankfully, there is a lot more awareness in the public about ethically made products, which value the maker whilst also being conscious of our impact on the environment. We all know what happened to the hare!